- a firm favourite with collectors. Shelley produced such a vast range of shapes that spotting items at fairs can be a difficult task. But don't worry, it becomes much easier once you are familiar with a favourite style. As we're concentrating on the more popular collecting areas, let's start with Queen Anne. Established in 1926 and produced for seven years, this is one of Shelley's best sellers. The cup is octagonal in shape, having four large and four small panels. There are over 160 patterns, ranging from floral to garden scenes, landscapes and all-over ground colours. 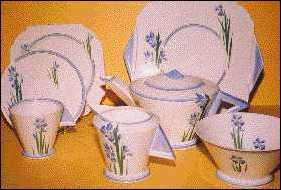 Prices for trios (cup, saucer, plate) range from £40 to £70 for the more common patterns such as Blue Iris or Daisy, with more unusual patterns in the £70­£130 range. The distinctive Vogue and Mode shapes, produced over short periods in the early 1930s, were a complete contrast, and unlike anything previously produced by Shelley. Vogue is recognisable as an inverted steep-sided cone with a solid triangular handle, while Mode has a less pronounced angle with a smaller foot to the cup. More than 50 patterns were applied to the Vogue shape and more than 30 to Mode, mainly of a geometric or stylized floral nature. Trios in the more common patterns are priced at £140­£180, whilst the rarer patterns vary between £220 and £300. The progression to a shape called Eve saw a Mode cup with a larger, open triangular handle. Although geometric patterns were used, there was much more of a floral trend at this time, and over 50 patterns were produced between 1932 and 1938. The price of trios ranges widely from £35 to £110. By 1932, curved and circular shapes began to replace angles and straight lines. The Regent shape is easily identifiable by its trumpet-shaped cup and circular handle. Patterns range from florals to swirls and banding, with a few geometric designs. Regent was produced well into the 1950s and it's not surprising that there are over 220 patterns. Banding and swirl trios range from £20 to £35 whilst pretty florals and geometrics can cost £35 to £60. One of Shelley's main attractions is the quality of both the body ­ whether fine bone china or earthenware ­ and the decoration. Arguably, this makes Shelley's wares some of the most important of the period. Shelley Potteries started life as Wileman & Co when, in 1862, Joseph Ball Shelley was taken into partnership with the firm of Henry Wileman at the Foley China Works, Fenton, Staffs. Over the years, Wileman & Co was a melting pot for many important designers such as Micklewright, Rowland Morris, Frederick Rhead and Walter Slater. By 1910, the name Shelley China was being actively promoted, and in 1925 it was changed to Shelley. Important designers of this time included Mabel Lucie Atwell, Hilda Cowham and Eric Slater. Some collectors will choose only perfect examples, whilst others accept minor damage or restoration - provided this is reflected in the price. However, I would like to remind collectors of the dangers of obsessiveness. Collecting is primarily intended for pleasure after all! To pass up the opportunity of acquiring a very unusual piece because of a small hairline crack or restoration may not be wise. Besides, if you are fortunate enough to find a perfect example later, you can always replace it. If in doubt when buying Shelley, always ask the dealer about the condition of a piece. Any reputable dealer will be happy to confirm this for you. All prices in this article are for guidance only. Many factors influence price including market forces, dealers' overheads and current trends.